According to the Chicago Sun-Times, a 22-year-old Chicago woman spent two nights in jail after taping three minutes of “Twilight: New Moon” while at her sister’s birthday party. Samantha Tumpach brought her new digital camera to the Muvico Theater in Rosemont, Illinois in suburban Chicago, where the party was being hosted. According to Tumpach, ushers said nothing as she snapped photos and recorded partygoers singing “Happy Birthday,” but rushed to report her to management when they noticed her camera pointed at the movie screen. Police were called, and theater management demanded that Samantha be arrested. 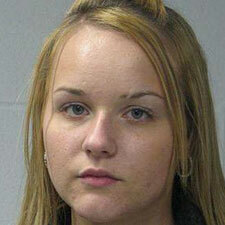 Because it was a Saturday, she could not be arraigned until Monday – after having spent two nights in a Rosemont jail. The police who handcuffed the young woman and led her away seemed very sympathetic, according to Tumpach, but since the theater manager insisted on pressing charges, they had no choice but to haul her off to a cell. Charged with felony criminal use of a motion picture exhibition, she was released Monday morning on her personal recognizance. If convicted, Samantha faces up to three years in prison.